Update December 2018: We would love to have more hosts to be able to link up new students with local people. We have currently had to stop any new registrations from students as we don’t have enough hosts to meet demand – so if you would like to volunteer as a host, please see the details below, and fill in the online form to register. 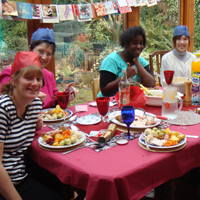 Would you like to meet international students and invite them to join you for a meal together in your home? Local Link is a scheme that links up international students and local people. This is a wonderful opportunity for the international students to meet local people, and to learn about life and customs in England. 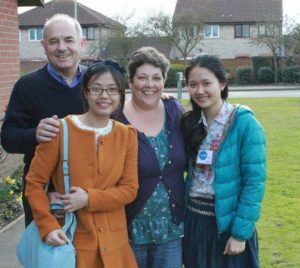 For many of the international students, they tell us it is one of their highlights of their time here, as it can be hard for them to meet people who are not students or on their course. You can be single, married, or part of a family, and of any age, in order to host students for a meal. We are looking for people to take part in this scheme who are committed Christians, and are part of a local church. We will ask your church leader or home group leader for an informal reference, before accepting you as a host. If you would like to offer hospitality, then we ask you to fill in the online form below, and we will then contact your church for a reference, before accepting you as a host. Once the students have registered with us (from when term starts, in October), we will write to you again (from October onwards), with details and some hints on hosting. Students do register with us throughout the accademic year, so we continue to need new hosts throughout the year, so please do sign up at any time to be a host. You will then be linked with one or two students, and we suggest that you offer a meal once or twice in the Autumn term, and if possible, then we’d suggest staying in touch into the Spring and Summer terms. The important thing from the student’s point of view is the contact with you as a host. You do not have to provide a three course dinner (! ), a simple meal or a light supper (maybe including some typical English food) will be appreciated. If you have any questions about Local Link, please do contact us.